38 x 44 cm Foldable and 2 units per pack. Very easy to use and remove - wont mark your car windows. Screens out Ultraviolet rays and reduces glare. The inside has an attractive design to amuse your baby on his journey. Please note designs may vary to illustrated. Can be fitted and removed as often as you wish. 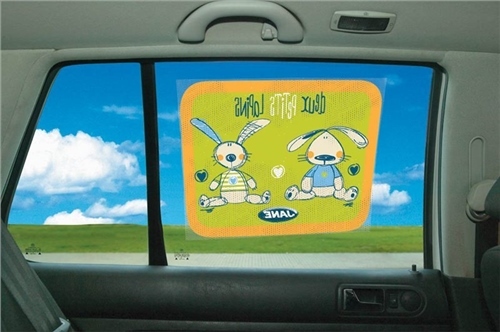 You can lower and raise the car window without having to remove the sunscreen. To install : simply place the sunscreen on your car window, then spread and smooth it out. No additional tools are need for fitting. If it loses adherance through use, simply submerge the screen in warm water and then re-apply to the window again. To remove, simply pull it off from one end. To Clean : use a damp cloth or sponge, with a mild non-abrashive liquid soap and then rinse with warm water. Our little one loves these - she smiles and giggles every time she sees them! It was almost worth it just for the entertainment she seems to get from them!! These are much more fun than the boring black and fabric ones you see on most cars. Would definitely recommend! I was very impressed that these didnt mark my car windows when we peeled them off to switch between cars. These could have been a little bigger but i suppose theyve got to make them compatible with all cars. Nothing fancy, nice pattern and keeps the sun off! Does what it says on the tin! These are easy to apply so theyre a bit of a bargain at this price.